My athletic journey is fairly new but full of amazing milestones already. Not so long ago in early 2012 I was weighing in at a measly 117kg. I bought size 40+ pants and would have to have their legs chopped..you get my drift! A doctor's visit in December 2011 set off the alarm bells. Trust me no one wants to hear the words "obese" but that was the honest truth. It is a warning that set me on a new course in life. Since then everything changed, I even took time out of a business I've been part of for nearly 10 years, just so I could pursue my new set goals and path. Today I'm not surprised when some people I've known for years or haven't seen in a while simply either just wave and move on when I greet or completely ignore me. The change has been slow and gradual but all intentional. So you ask, what are those goals that changed the course? I guess one thing leads to another really. I started to get active (I'd been playing golf till then), running a bit, bought a friend's old bicycle (8 speed Sora, heaviest frame you can imagine)..In no time we did Corporate Challenge Tri, I cycled (18km in just shy of 1hr) and ran (4.2km in over 35min)..My goal in 2012 was simply to lose weight by riding and running and it sort of worked. By that year end I was 12kg's lighter. in 2013 I decided to volunteer at Ironman SA, they put me in bike check in and out, candy store! Right there and then the bug bit me. When I saw those broken soles coming in just before midnight, some couldn't even walk properly, I knew that my goals suddenly went on EPO. I wanted to be an Ironman. That for me would be my plan to accelerate weight loss and live healthy again. As I said these things kind of lead from one to the other. It's July 2013, my 2014 Ironman 70.3 Entry paid, brother couldn't even swim then. so what now? The only option I had was to do what I did when I decided to play golf, I went and found out who was the best coach in the business. I could have asked my friends (who were already playing) to teach me but I decided not to. 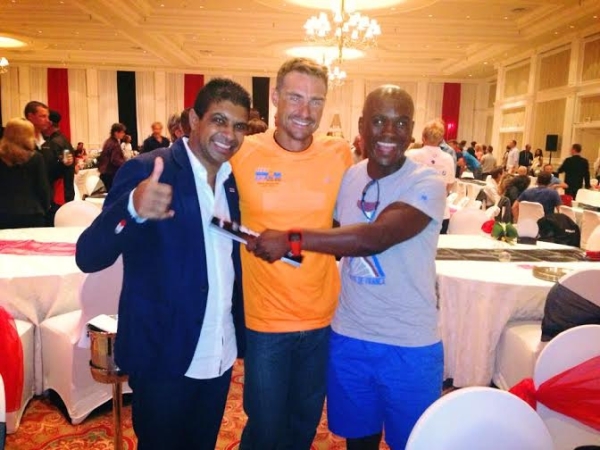 So even with this Big elephant called 70.3 looming large I did not hesitate to sign up with the best in the game. 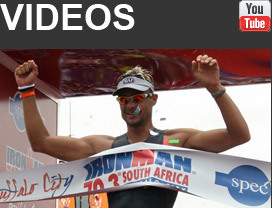 Thanks to the Ironman SA newsletter, there was a link to Tri Coaching services with contact details and all. With about 6 months to go I thought these Tissinks' must be taking a big gamble with their credibility. However I had faith in that these people know what they are doing and so I need to play my part. When we are sick we go to doctors and they prescribe stuff to us, we follow without question. Triathlon is just as much a matter of survival, so why question the Coach's prescription. That's been my attitude ever since. It starts with discipline, organize your life around your goals, if the goal is big enough, nothing will come before it (except family). Long story short, the Tissinks' helped me through to a successful 70.3 (7hr23) and IMSA 2014 (14hr16). The most astonishing take out from both these events is that my race time mirrored my best training efforts (i have the files to prove it). So I repeat, no need to question or second guess the coach, follow the plan and success is achievable. I got mine. 2014/15 has been great so far, in September I joined the 3T Finish Line squad with the Tissinks'. I've seen my training and race times tumble, not surprised. 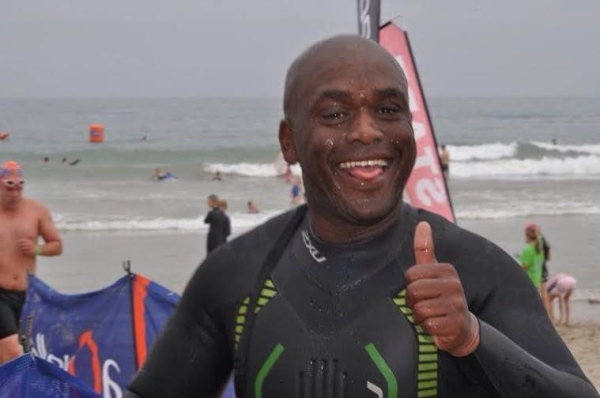 I posted respectable times at the Knysna Forest Marathon (4hr07 with the 1st 21km at 1hr40) from there I raced Amashova Cycle Tour, 106km and posted 3hr40, a good 20min off The Herald Cycle (easier course). 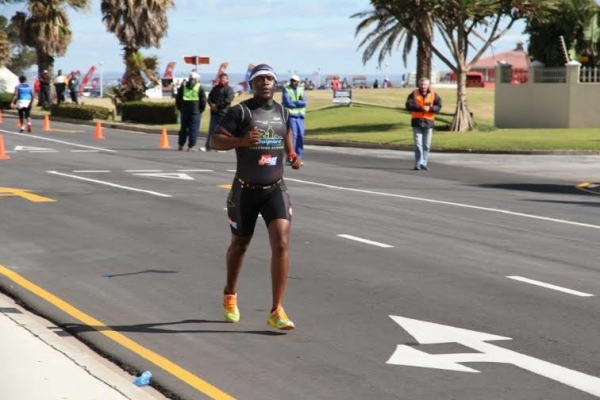 The highlight so far, after about three months being part of the Finish Line Team Tissink squad was the recent gale forced NMB Half Marathon, posted 1hr36 in really horrible conditions. How was this possible you ask? Follow the plan, those Fartlek (fart like) sessions, those SLOW time on legs session paid dividends. It's not just the run and bike that's improved a great deal, my swim is getting better all the time, I'm a lot more comfortable in the water (pool & sea). I even posted a PB, 26min 1.2km sea swim the other day. So whatever your goals, mine are simple, just get better and better in all three disciplines as one sport, and what was a weight loss mission has become a lifestyle. I have no other ambition other than being better than I was yesterday, It's personal and it's fulfilling when you see results come through. If you decide to employ the services of a coach, then follow the system. If they're any good, results will come. Thank you Ray and Natalie for taking a chance with me and thanks to my wife and kids for the support and sacrifices. Here's to a lean mean racing machine in the making...see you at IMSA 2015.